Just before the fall semester began, a letter addressed to students in the class of 2020 from the University of Chicago’s Dean of Students, John Ellison, went viral. The letter has been shared, applauded, attacked, dismissed, responded to, and discussed throughout September, as students flock back to colleges and universities across North America. Even here at Kwantlen Polytechnic University, the debate rages on. Kimberley McMartin, Board Organizer for the Kwantlen Public Interest Research Group, is an advocate for trigger warnings and safe spaces. KPIRG Director of Campus Life Lincey Amora echoes McMartin’s sentiment, arguing that, at their core, safe spaces are meant to be “inclusive” areas where both instructors and students can raise awareness about social justice issues. Both Amora and McMartin’s ideas of what a safe space is differ from the picture Ellison paints of them in his letter to new students. Instead of a haven for intellectual cowards, as he alleges, they are a place of freedom from potentially oppressive material that marginalized students have to face. Much like safe spaces, Amora recognizes that “trigger” or “content warnings” also offer students a respite from problematic experiences. Professors can offer such warnings in advance of potentially offensive material to help promote “acceptance, respect, and education” in the classroom, says Amora. Not everyone at KPU agrees with these sentiments, however. Psychology instructor Gira Bhatt believes a rigorous commitment to academic freedom is more important to a student’s development than safe spaces or trigger warnings. “I am not here to convert people to my views, and I am not going to accept somebody telling me that ‘you cannot say this in the classroom,’” she argues. Bhatt believes it is the instructor’s duty to find a balance between material that challenges their students and material that could potentially be harmful. When that balance is lost, she thanks her students for having the courage to speak openly with her before and after class about their troubling experiences. Bhatt echoes a few of Ellison’s ideas about what a university education and campus should be. Both believe critical thinking and respectful dialogue can coexist without the barrier of safe spaces or trigger warnings separating one from the other. “While it is certainly the case that some university spaces can be upsetting and may give rise to emotion of various kinds, I do not think it is necessarily the case that this is a bad thing,” he says. Walton argues that, by confronting a negative experience through course material, a student can move past their emotional response and begin to think critically about a subject they would not otherwise be able to confront. Though he is wary of trigger warning, he does acknowledge that absolute dedication to free speech does not come free of charge. So who bears the brunt of that price? Do marginalized students pay more for the right to freely debate controversial topics than their more privileged classmates? And what happens when students and instructors don’t agree on where the line between offense and freedom of expression rests? According to Educational Studies faculty member at KPU David P. Burns, the balance can only be struck when a high bar of mutual respect has been established between the faculty and the student body. “In the classroom, it is important to make sure that persons are able to represent themselves in the most authentic way possible and still be respected,” says Burns. Burns, however, is careful in his application of content warnings in his classroom, given that there are inherent educational purposes to difficult dialogue. 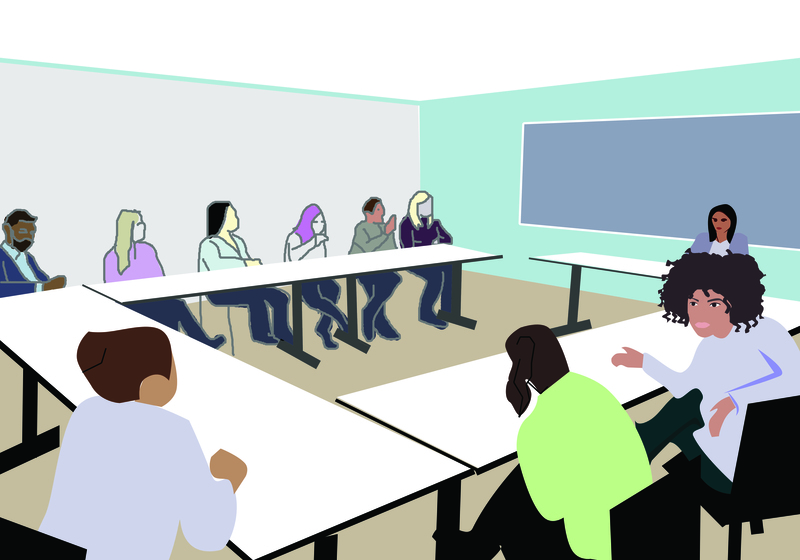 Conversely, some proponents of safe spaces, such as Journalism and Communications faculty member Katie Warfield, argue that empathy and inclusivity are the remedy to most anxiety-inducing conversations. This is because engagement with controversial and potentially triggering material becomes inherently risky for some and, at times, traumatic for others. “It is not human to assume that students should be able to bracket their emotions, their personal experiences, their embodied reaction to ideas, from their cognitive digestion of [these] ideas,” she says. The humanity of the students, Warfield believes, comes before the absolute free flow of ideas. She believes that self-expression is inappropriate when it infringes on the rights of others, or hampers their ability to feel secure in a classroom setting. In cases like this, she favours the limiting of boundless academic freedom. In Warfield’s view, this clashing of freedoms is again remedied, at least in part, by empathy—in addition to slow cultural changes.